“Different World, Same Hero”. How apt a description this is! Starting with that cover, things already hint that this is not your typical Batgirl story, not at all. In fact, in this particular crossover, while the Barbara Gordon is still Barbara Gordon, her crime-fighting persona is that of Bluebelle, not Batgirl. In fact, all the characters are known by different monikers. Since this is a new world, it of course also has different personalities for the “same” characters. Like Charise Carnes for instance. 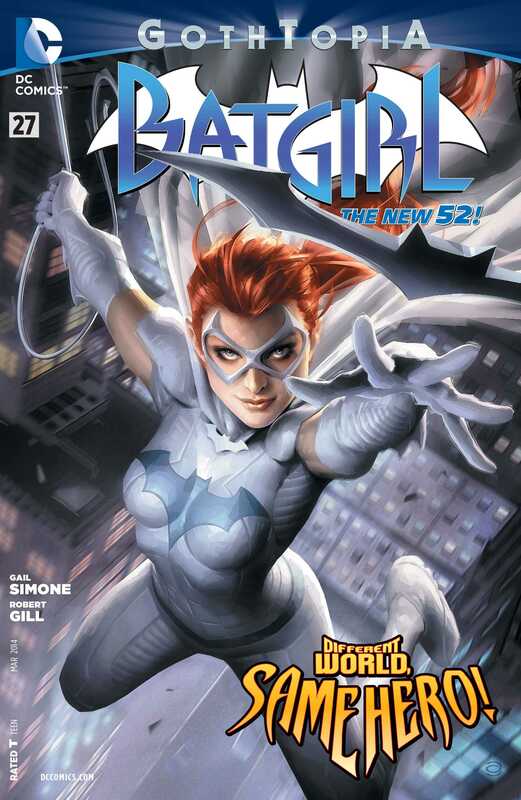 In the New 52 continuity, she is a villain who goes by the name of Knightfall and is more than a match for Batgirl. In Gothtopia Charise is Barbara’s best friend. And her superhero moniker is Daybreak, a nice play on her New 52 name. Much as with John’s story, it is slowly teased out that things are not how they seem. In a world where there is a Joker Corporation that produces ice-creams, how can things actually be normal? They can’t be, no! That’s the central theme of this issue. We meet a new character who becomes the main antagonist of this issue, and through her, we see the evidence of the dark truth, bit by bit. Her story is balanced against that of Barbara, who apparently has a perfect life, with a perfect family and perfect friends. Her brother is normal and a social worker. Her mother lives with them. Ricky her boyfriend is well and good. She has a great friend in Charise. Everything is perfect. Everything is utopic, or close to it at least. But, that’s when the disaster strikes and things take a twist for the worse. One of the things I’ve loved about Gail’s run on Batgirl since the New 52 launch is how well she has handled the regular Barbara. She shows the same flair for the character in this issue and right from the get go we know that while the setting may be different, the character at her core is still the same. The story is fast-paced, although not overbearingly so, and it flows really well because throughout Gail delivers some great moments that excite and entertain in equal measure. Even when things are down and things look bad, there is a sense that it is all going to work out, because it is Gothtopia after all. You don’t see the same positivity in the regular New 52, where things are almost always very dark and while you know that things are going to work out, the daily lives of the characters are almost always pretty messed up. I love all the teasers about the larger story of Gothtopia and I’m really excited to see where things are going. This is going to be quite an intricate story and I want to see more of everything, basically. Robert Gill is the new artist on the series, replacing Daniel Sampere and inker Jonathan Glapion. His artwork really fits the new story, what with all the general air of positivity here. Its really interesting to note all the differences between Robert’s pencils and Daniel’s pencils from the previous few issues since he came on to the title. I would have loved to see how Daniel would have handled this story, but I’m glad that his (temporary?) replacement is just as talented. There are some panels where Robert’s characters have weird faces that don’t match how they look either before or after, but by and large, that’s my only criticism of the art. All the action takes place during the day, and all the characters wear bold, bright colours to reflect that, in stark contrast to their darker costumes from the New 52. Blond as the colourist is still damn good, and that’s really it, I think. Overall, excellent issue and a great start for the title in the new year. More Batgirl: Vol.1, Vol.2, #23, #24, #26. Posted on January 15, 2014, in Comics Reviews, Review Central and tagged Alex Garner, Barbara Gordon, Batgirl, Blond, Bluebelle, Charise Carnes, Comics, Comics Review, Commissioner Gordon, Daybreak, DC Comics, Gail Simone, Gotham, Gothtopia, Joker, Knightfall, New 52, Review, Review Central, Robert Gill, Superheroes, Supervillains, Vigilantism. Bookmark the permalink. 16 Comments. Gill is not the new series artist, he only did this issue. Fernando Pasarin and Glapion are still the regular artists. Having gotten back into comics after a short(ish) gap, this is teh first issue of Batgirl I have picked up since the first story arc of the New 52 concluded. I love Gail Simone, and am looking forward to the whole Gothtopia storyline (do we know if it will extend beyond Detective and Batgirl, and tie in with the other Bat Family books as well?). I tend to really enjoy stories that give an alternate take on characters I love, which barbara Gordon is definitely one. Yes, my understanding is that this will affect the other books as well. Maybe not Batman, since that is currently in its own arc that will carry on till #30.